After a run at the 6th Annual First Look Repertory of New Work at Steppenwolf Theatre in Chicago, Sam Marks’ dark examination of marriage comes to The Flea. The Old Masters will be directed by Resident Director Brandon Stock in his Flea debut. The Old Masters features three Bats that were most recently seen in The Mysteries – Adelind Horan, Rory Kulz, and Alesandra Nahodil. Understudies include Alex Coelho, Anna Dart, and Rachel Yong. The creative team includes set design by Andrew Diaz (Smoke, The Cutthroat Series, The Feast), lighting design by Jonathan Cottle (Mexicans, White Hot, a cautionary tale, Job), costume design by Travis Alexandra Boatright (The Cutthroat Series, The Feast), and props by Cristina Pitter (The Feast). Sam Marks’ play The Delling Shore received its World Premiere at the 2013 Humana Festival at Actors Theatre of Louisville, under the direction of Meredith McDonough, and was developed through the Sundance Institute’s 2011 Theatre Lab. 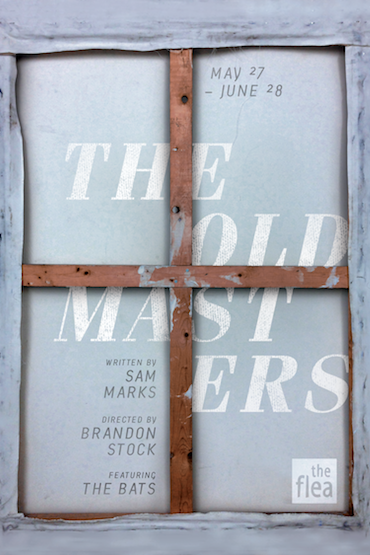 Sam’s play The Old Masters was produced in Steppenwolf’s First Look Repertory of New Work and directed by Daniel Aukin. His play Brack’s Last Bachelor Party received its World Premiere from Babel Theatre Project at 59E59 Theaters. Sam received his Off-Broadway debut with The Joke at Studio Dante, directed by Sam Gold. Sam was chosen as one of “50 Playwrights to Watch” by The Dramatist Magazine, and his other New York productions include Nelson; The Bigger Man; and Craft (The Flea Theater). Additionally, Sam’s plays have been workshopped and read at Arena Stage, the Atlantic Theater, Manhattan Theater Club, New York Theater Workshop, Playwrights Horizons, Portland Center Stage, The Public, The Rattlestick Theater, and The Vineyard, among others. Sam is currently a resident playwright at the Huntington Theatre in Boston. Sam is also developing a project at HBO with Steve Buscemi and Stanley Tucci producing. He recently created and developed a TV series in collaboration with CBS studios, the late Phillip Seymour Hoffman and Cooper’s Town Productions. Sam has taught playwriting and screenwriting at Brown University, Harvard, Drew University, and RIT. Brandon Stock is from Fresno, California. He received his BA from Loyola University, Chicago and MFAin directing from the Actors Studio Drama School. He has directed, designed, stage-managed, and worked electrics in New York City. He has worked on productions for Outside Inside Theater Company, Manhattan Repertory Theater, and FringeNYC.